Advantages – When the plant is away from the occupied spaces, there is very little noise. The entire system is controlled from one central location. This allows the system to start and stop on a timer, usually set to work hours. Maintenance is also easier as there are central locations for each area that requires servicing. Disadvantages – The biggest drawback is the cost, as plant systems are expensive. Also, space is required for the ducting, plant room, and control room. There is no real control at room level, except to use louvers and control the air flow into the room. Advantages – The primary advantage is that fan coil units are cheaper to install than central plant systems. Another advantage, unlike the central plant, is individual room-level control over the temperature. Fan coils do not require extensive ducting and can heat and cool. Disadvantages – There can be noise from the indoor fan component especially during speed changes. Also, each unit needs maintenance and it has to be on-site. Since it is a pipe based system, long runs of pipes are needed. Heating requires a boiler and cooling requires a chiller. 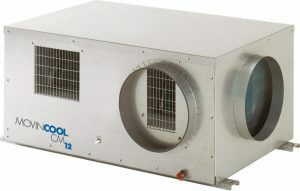 Unlike a traditional fan coil unit, the MovinCool.com offers a totally self-contained unit.